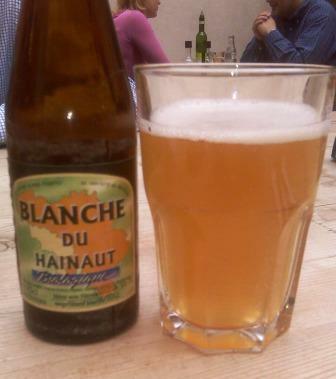 Somehow, during a rather hectic week, I managed to chalk up two new Belgian beers during lunch meetings. And both were organic white beers oddly enough. Yesterday, I had a Blanche du Hainaut Bio at Le Pain Quotidien. I was a bit disappointed, I have to say. It was somewhat thin and a bit flat, missing some fizz. The predominant taste was heavy yeast with nothing sharp or spicy to cut it. It's produced by Dupont, makers of the excellent Saison Dupont and the lovely Moinette Blonde, so I had expected a bit more, to be honest. 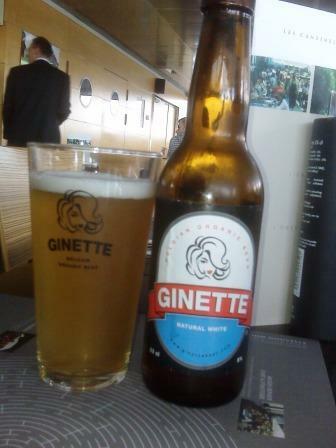 The second organic white arrived on today's lunch table at the restaurant of the Musical Instruments Museum: Ginette. I love the labelling. And the beer's good too. It starts off with a fairly foamy mouthfeel, and then moves to something I'd consider rather hoppy for a white. I don't get too many spices, but it is smooth and delicious. Of these two organic Belgian whites, then, Ginette clearly had the edge for me.